Stacked Pickle, Thousands of entrepreneurs and future business owners slated to attend Franchise Expo Midwest. Indianapolis, IN / August 2018 – Stacked Pickle, Indy’s #1 restaurant and sports bar, is heading to Franchise Expo Midwest. 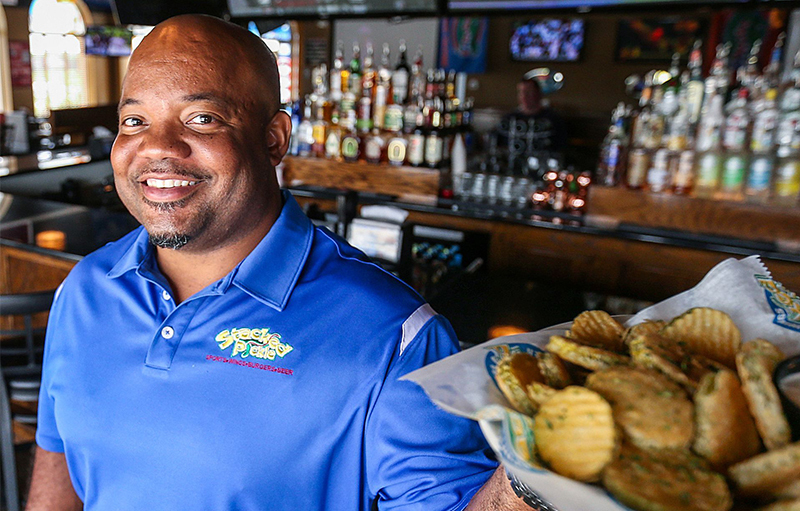 Under the leadership of Gary Brackett and his team of experienced restaurant operators, Stacked Pickle has been aggressively marketing to franchisees over the past couple of months. With 9 locations already in place, we are looking to add 10-15 more restaurants throughout the Midwest over the next 12 months. 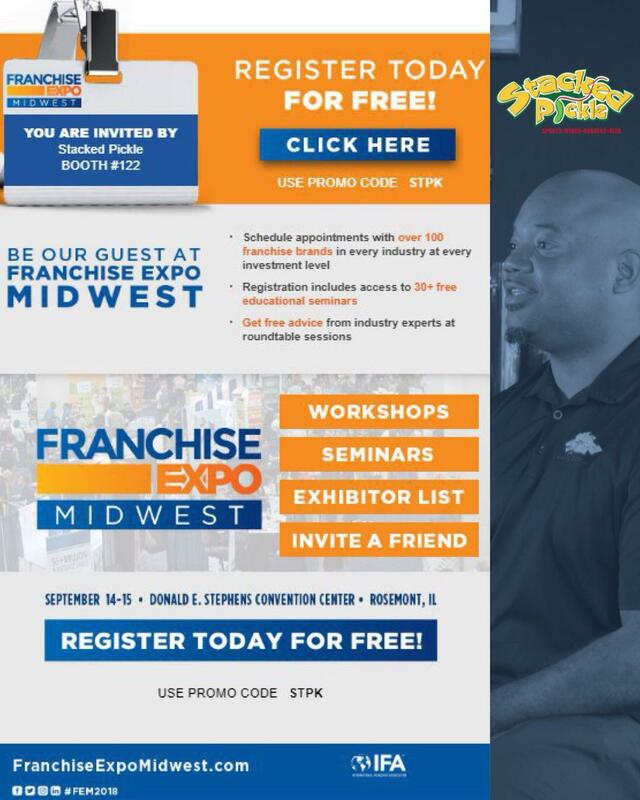 With thousands of entrepreneurs and future business owners slated to attend Franchise Expo Midwest, we see this as a perfect opportunity to make a splash in the minds of prospective franchisees. What Is Stacked Pickle? Who is Gary Brackett? We are a neighborhood restaurant and sports bar. Generous portions, fresh ingredients, great prices and legendary customer service are parts of our identity. Patrons enjoy local and national sports on over 20 TVs, live music and family-friendly activities and specials. Variety is another calling card for Stacked Pickle with wings, burgers, wraps, salads and of course, fried pickles, being part of the menu offering. If the name Gary Brackett sounds familiar, there’s a reason. Our CEO spent nine years as a middle linebacker for the Indianapolis Colts. He started in two Super Bowls, winning one, and piling up over 700 career tackles in the process. After retiring from the Colts in 2011, transitioning to the restaurant industry was a natural move. “What I do now is a form of coaching. My group operates as a team. We create game plans and execute them with success,” said Brackett. He started as a partner with the Stacked Pickle concept, but quickly learned the ropes and bought it outright over three years ago, which lead to the development of Brackett Restaurant Group. GB at the Plainfield Pickle! The Stacked Pickle franchise opportunity is ideal for business-savvy operators with management experience. Franchisees are provided with an extensive training program and ongoing corporate support. At the largest franchise expo in the Midwest, you will have a perfect opportunity to see what the Stacked Pickle is all about. For more information about the Stacked Pickle and franchise opportunities, visit www.BuildThePickle.com. Stacked Pickle & Brackett Impact Foundation Deliver A Holiday Meal To Horizon House.